Knives: At a glance we have handle options including Burl wood, Paaka wood, Blackwood, Stag Horn, Bison horn, Bone, and more - just ask! Many more handle choices are available for custom orders - contact us today for a complete list! 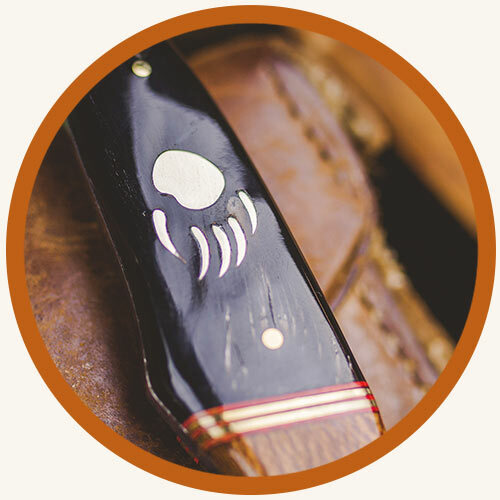 Each of our knives have the option of a custom design including your own corporate or event logo or personal design. Also available are our any of our wildlife series designs, a series of 17 Montana wildlife inspired designs. A beautiful walnut display box is available for all knife purchases for an added cost of $5 per product. If you are ordering a custom knife inlay we will inlay your walnut box with the same design.